The Gentleman Crafter: A Dylusional Celebration: Birthday Giveaway! Today's post is all about being Dylusional! I found Dyan Reaveley's Dylusions at CHA a couple of years ago. I sat and watched Dyan transfixed by the amazing things she could do with spray ink and stamps. 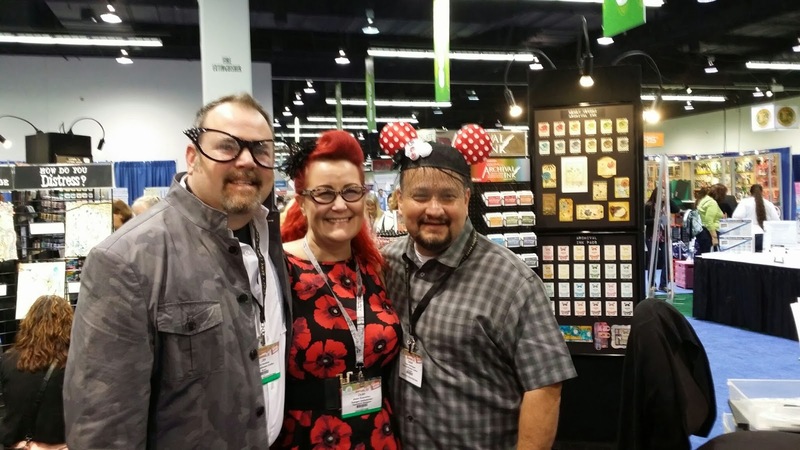 At that point, I had never been into stamps, stamping or inks until I met Dyan... Her fun bright colors and funky fun stamps just made me Happy and I've been in love with her and her products ever since. I have the privilege to call Dyan friend as many of us do. She has been such an inspiration to me and I will always be appreciative of the new window she opened up for me with Dylusions! So, why the Dylusional Post? Tomorrow, Monday, March 10, 2014 is Lady Dy's Birthday! Yahoooo! I wanted to help celebrate this amazing woman's Big Day on this side of the pond. I have gathered some Dylusional happiness together with the AMAZING help of The Crafty Scrapper who was kind enough to donate items for this Dylusional Birthday Giveaway! THANK YOU CRAFTY SCRAPPER! The package includes: (1) Large Dylusions Creative Journal, (1) Dyan's book, My Creative Journal Journey, (14) Dylusions Ink Sprays, (3) Dylusions stamp sets, (1) Ranger Glue Stick (1) White Uniball Signo Pen and a cool kit with (2) stencils, some book paper an a Black tag that Dyan gave to me last summer. This awesome Birthday Bash Giveaway is a $200.00 Value!!! Join me tomorrow for a Birthday Blog Post with a project I created for Dyan! Happy Birthday Dyan....I love your creativity and spirit! And we share the same birthday, well almost, only 4 days apart! Have a great day and a healthy year! HAPPY BIRTHDAY DYAN!! Wishing all you are wishing for, hope you have a most fabulous day and joy all throughout the year! Happy birthday!! My daughter and I recently got ourselves your art journals and are having a blast using them to learn about different medium. Thanks so much for awesome products! We hope you have a great birthday!!! A big Happy Birthday to you Dyan! I hope your day is as AMAZING and WONDERFUL as you are! I love watching your videos and all the blow-your-mind creations you make. You are one in a million! Sending lots of Love your way on your special day and always! Happy birthday". Hope it's creative and rewarding! Happy Birthday to you ...Happy Birthday to you...Happy Birthday dear Dyan....Happy Birthday to you!!! A Very Happy Birthday to you! May your special day be filled with lots of love & laughter, surrounded by family & friends near & far!!! Happy Birthday Dyan! Have a great and creative birthday! Happy Birthday, Dyan. I'm looking forward to try some of your products. They are so bright and funky. My all your Birthday wishes come true!!!!!! Happy Birthday to you, Miss Dyan! I hope this is the start of a most awesome and creative year for you. Wishing you health and happiness. I'll hope and wish you all the best for many many years to come!!! I'll sincerly wish you a wonderful day!! Happy birthday Dyan. May all your dreams come true as mine have. God Bless! Happy Birthday Dyan! Hope you have a wonderfully, fantastic day! Jim could not have said it better. Dyan has opened up a whole new world of creative expression for me and I love everything Dylusional now. Thank you Dyan you are amazing and so much fun to watch. Hope your birthday is as amazing as you are. Have a very happy birthday. Happy Birthday Dyan! Enjoy your special day and stretch in into the entire week! Happy Birthday, Dyan. I love the brightness of your sprays and the quirkiness of your stamps. And I love to see you demonstrate your products! Happy birthday Dyan! May this year be the best one yet, and may all your birthday wishes come true! HAPPY HAPPY BIRTHDAY Lady DY!!! and many more. TY to Jim and Crafty Scrapper...what an AMAZING gift give away. Happy B'Day Dyan. Your rainbow-licious style brings me back to the days of the VW vans painted with flowers, swirls and Peace Signs. Happy Birthday to you! Hope your day is as fun and fabulous as you are! Happy birthday to a woman who has opened so many windows for me... both art and personal!! Happy Birthday Dyan! Thank you for your contribution to the art and mixed media community!!! Dyan, 'on the day that you were born, the angels got together and created an artist through & through...'! Hope your day is filled with lots of laughs, loves, hugs and much merriment! Enjoy your celebration in jolly old England! Birthday greetings from across the pond! Hi Dyan, Wishing you a happy, amazing, fantastic, terrific, awesome, exciting, fabulous, creative, blessed birthday!!! Do something fun just for you...dance, sing, craft, read, relax, eat chocolate or something you enjoy because you deserve it. You are special and we are blessed because of you. Happy, Happy Birthday to a wonderful lady who gives so much to us!! Your colorful world brings me so much joy. I love your stamps and stencils. Your sense of whimsy is delightful. It always takes me to a happy spot when I see anything that you do or that others (especially Jim) do with your products. Your videos are so much fun to watch, you make me feel like an old friend. Happy Birthday Lady Dy!! Hope your day is as wonderful as your craft makes us feel!! Happy Happy HAPPY Birthday Dyan! It has been so much getting to know you through Jim, The Gentleman Crafter! You are an inspiration! Thanks! I wish you a very happy birthday, Dyan. Thank you for bringing creativity to us. Prayerful hugs sent too. Happy Birthday Dyan!! Wishing you many, many more. I have recently been inspired by you and your creativity and slightly warped sense of humor to join in the Art Journaling world. I love all thing Dylusional and that is where I have started. I can't wait to see the awesome piece Gentleman Jim has created in honor of your birthday. Happy Birthday Dyan !!! Thank you for turning me on to art ! I considered myself a crafty person but you made me find the courage to start an art journal with your fabulous journal and festive inks!! I have four pages done and believe it or not I think I am "getting" it !!! I cannot wait to be able to get all your inks and stamps ! !Have a wonderful art filled day and enjoy it YOUR WAY !!! The happiest of birthdays to you Miss Dyan. You bring color and creativity into everyone's life. I wish you the most colorful, creative birthday ever! ♬ Happy Birthday to you ♬, Dyan... Many happy returns of the day! Looking forward to seeing what Jim creates and I'm sure it will be Dylusional-tastic!!! Both you and Jim have been an inspiration to me and what a great prize giveaway to get started... Have a great day! Happy Birthday Dyan !!!! I hope you have a wonderful day and celebrate in style. I can't wait to see what Jim creates with all the wonderfully colourful sprays. Wishing you a super "Happy Birthday" Dyan.....love your amazing style, color and flair. Thanks to Jim, Cesar and The Crafty Scrapper for such a Delightful Dylusional give away!!!! Happy birthday to you, Dyan, and best wishes from Vienna! Thanks to creative minds like you (and Jim ;) we never run out of inspiration! So thank you for sharing your creativity with all the people out there who love to get their fingers dirty and their minds spinning with imagination! And Jim, should my number be picked, please pay it forward and select someone else as I own almost all of Dyan's products. Happy Birthday to an amazing, talented, and witty lady! I love your products and I love your carefree personality! I hope you have a totally awesome day and spend it with lots of friends. Many happy returns of the day Dyan. Hope you have a great one!I look forward to taking a workshop with you one day. Happy Birthday Dyan! Love your style and your talent, thanks for bringing so much color into my art journal! Happy Birthday Dyan! Although I only watch your videos on YouTube you seem like an amazing, wonderful, creative individual. Have a great b-day! HAPPY, HAPPY BIRTHDAY to DYAN...the QUEEN of ART!!! I wish you all you are wishing for...and more!! I love you and I love your art. I hope this little message finds you feeling back to your old crazy self!!!! You have opened so many artsy, messy doors for me and given me the courage to just PLAY!! Jim, thank you so much for the opportunity to wish Dyan all the best in life on this forum!!! Carolyn, thank you so much for the wonderful prize package so generously donated. Yet another reason to love The Crafty Scrapper!!! Good luck to everyone!!! Happy Birthday, Dyan! Yesterday I made several backgrounds using your beautiful and colorful sprays and combining them in a myriad of ways. I was hoping to step out of my comfort zone and come up with a new (to me) color palette. Thanks for all of your inspiration! Hope your special day is fabulous and full of love and COLOR! Happy Birthday, Dyan! I wish you much more wonderful projects and ideas! You are making our life COLORFUL! How sweet of you Jim - and thank you to the Crafty Scrapper too! Wishing you a wonderful birthday Dyan! I do hope that you are feeling better and will be able to celebrate your special day in a suitably colourful way! Happy Birthday Dyan!!!! Hope you have a Fab day! Thanks for coloring our world with your awesome sprays! Happy happy birthday Dyan. Love your colorful art and style. Oh,Happy Day! May it be one of the best days ever and continue on! HAPPY BIRTHDAY, Lady Dy!!! Thanks for keeping our world from being gray and far from mundane. Most of all, I value your honesty. Happy Birthday to the one and only Lady Dy!! You're such an inspiration! Wishing you a fabolous day! Hello Dyan, i´d like to wish you all the best for your birthaday. I hope your birthday is filled with love, joy and happiness and that all your wishes come true. I hope you give us a lot more inspiration in the future. Here's wishing you a FUNtabulous day Dyan!! Happy Birthday! Wow what a birthday giveaway celebration!! Thank you Jim for arranging the fun and Crafty Scrapper for awesome prizes! Happy Birthday, Dyan! I hope your birthday is filled with love, joy and happiness and that all your wishes come true. To a very Special Spirit. Happy Birthday Dyan. So glad that Jim ask all of us to celebrate with you. Happy Birthday Dyan! Here's wishing you all you can imagine for your special day. Many, many color-filled birthday greetings comin' your way from across the pond! You just keep getting better-here's to many more wonderful, colorful years! Happy birthday Dyan may it be as colorful as the sprays in your product range!!! Birthday Wishes to you Dyan! Your art and spirit are so inspiring. Have a spectacular birthday and wishing you much joy, laughter, and creativity in the upcoming year. Jim, you don't need to include me in the drawing as I already have my Lady Dy basics! Thanks. The happiest of birthday wishes to Lady Dy! What a talented and kind person she is ~ Happy Birthday! Happy Birthday Dyan! Thanks for all your creative inspiration, and wonderful artsy stuff, love it, and can't get enough of what you can do with them! Happy birthday Dyan! Your journal and spray inks were my introduction to art journaling and your sayings are my go to stamps for my card projects. Thank you for inspiring me and I can't wait to see what is next in your life! Hi Dyan, I'm hoping this finds you feeling better. Know that you are loved by many and we all wish you the best not just for today but every day! You have given so much of yourself and inspired so many others, we really appreciate you! Hugs!! Happy Birthday to the Queen of spray ink, rubber stamps and all things ghosting. May you enjoy your day with happiness and creativity. Happy, happy birthday, Dyan. May your day be a colourful one! Happy Happy Birthday Dyan. Hope you have a wonder filled year. Happy birthday to you, Dyan! and many many more! Thank you for inspiring us all. (singing in my best voice) Happy Birthday to you, happy birthday to you, happy birthday dear Dy-an, happy birthday to you! Hip hip hooray, hip hip hooray, hip hip hooray!!! Happy Birthday!!! Hope its a great one!!! Happy Birthday Dyan. I just used your sprays today. Can you say AWESOME! I hope you have the best day ever! Wishing Dyan the happiest birthday ever! I simply adore all of her products...it has opened a whole new world of creativity for me. Thank you for all you do and to Jim for offering a fantastic opportunity to win some great new products. Happy Birthday Dyan! Wishing you a fun-filled year! You are such an inspiration, and love love love your character. Have a wonderful birthday, Dyan! I adore your stamps and all your projects. I am always inspired by your work. Happy Birthday Dyan! You are such an inspiration to all. I love that you teach that there is no right or wrong I. art Journaling and that anyone can give it a try. Have a wonderful day. Happy Birthday Dyan! You are such an inspiration to me! I love all of the Dylusions goodies I have! You have taught me so much; but the one thing that stands out always... is to be free, enjoy your journal, creating, and your life... let no one stand in your way! Thank you for that! Hugs to you!!! Also Hugs to Jim and Cesar too! Happy Birthday Dyan. Hope you have a wonderful day! Have a wonderful birthday, Dyan! I love your "sayings" stamps and use the ones I have for funny cards or tags. Happy, happy, happy Birthday, Dyan. I love all your stuff! You are so creative and come up with such fun and colorful projects. Love your journaling! Pick me, please! Happy Birthday to you. Happy Birthday to you. Happy Birthday Ms. Dyan, happy birthday to you. So another year has gone by ehhh! (hear the Canadian in me ehhh! ) From across the big blue pond, I'm wishing you the happiest of days tomorrow. This time tomorrow I'll pick up my glass and toast a "cheers" in your honour. It will be a big glass, enough for two! lol. Miss Dyan you have given all of us viewers so much fun and inspiration that it is now our turn to toast you. I wish you a very Happy Birthday. I wish you a wonderful day filled with love, family and much happiness. Enjoy your day! Happy birthday your highness! Love your style, art and creativity! Many more! Happy Birthday Dyan! Hope you have a great day. I haven't played with ink sprays yet but it looks like alot of fun! Happy, Happy Birthday to you and may you have many more!!! Jim, what a wonderful prize package to win. Happy Birthday Dear Lady. Thank you for your unique beauty and zest for life. Thank you for sharing your life spark no matter your day with all of us known and unknown to you. Celebrate your day with the same abandon you share in your art! Truly! A Very Happy Birthday to a Beautiful and Creative Lady Dyan. Happy birthday to the most original, creative, whimsical and fun teacher....hope its happy Dyan! Happy Birthday Dyan!! I am a fan of your crazy, crafty, and creative art! Make your day happy! Happy birthday! Cheers to another year young, full of life, and color!!! With her vivid head of hair! In the manner of her dress! So send birthday wishes lickety split! For being such a great craft store! Happy Birthday Ms. Dyan. I so appreciate all you have taught us. So fortunate to be able to enjoy a class with you last year. Inspiration, laughter and teaching us to do art our own way - that nothing is "wrong" we each have our own artist within. Such a darling, sweet lady. Thanks so much for all you do and share. Happy happy birthday Dylan! I hope you have the best birthday ever. Thanks for all the great products I love playing with your stuff, makes me feel young again. And thank you Jim for sharing Dyans products with us, I'd love to win. Happy birthday Dyan!!! Thanks for the chance to win. Happy Birthday Lady Dyan! (I am doing my best curtsy-pretend I am in front of you) I hope you have the most AMAZING day, oh heck have a AMAZING YEAR! Happy Birthday Dyan, wishing you a creative and wonderful day, and even more to come. Thanks for all the inspiration. Hope you have a fabulous birthday, Dyan.. you deserve it! Jim, you are a star, what a great giveaway. Hope you enjoy the day too!! Happy Bday, Lady Dy!!! Have a great day celebrating YOU !!! Hope you are having a wonderful creative birthday! Happy Happy Birthday you beautiful wonderful woman! Dy has been an incredible inspiration to me since I started on my journey and there is nothing more beautiful for building up vibrant and delicious color in my journals and in my book covers and projects than the Dylusions sprays. I hope your birthday is a day of all the things you want and none of the bits you don't and that all of your wishes come true with a little extra! Have an EXCELLENT year! Happy birthday, Dyan. I really enjoy your products AND the videos on YouTube. You ROCK! Happy Birthday, Dyan. Luv those bright colours! You color my world with your amazing inspiration! ..its your day Dyan.... soooo C E L E B R A T E and Enjoy... happy happy Birthday !!!! Happy Birthday, Dyan! Thank you for bringing splashes of color into our lives and art work, and all those inky fingers! HAPPY HAPPY HAPPY BIRTHDAY Dyan Love you arm. H.B DY!!! Yummy give-away & thanks for a chance to win.....?!! Hey Dyan - hope you have a wonderful, colorful Happy Birthday!!! Can't wait to see you again this year! Happy Birthday Dy! Thank you so much for introducing me to spray inks. I LOVE the effects (and sometimes happy accidents) I can create with them! Happy Birthday to Dyan. Thanks for a chance to win the wonderful supplies. Happy Birthday to Dyan, one of the most creative amazing women out there! Thanks for the chance to win some fabulous supplies! Thank you Jim and Crafty Scrapper for the chance to win these Dylusional Delights! Happy Birthday! I am a huge fan who is filled with awe towards your creativity and gumption! Happy Birthday Lady Dy. I truly hope you have wonderful day. Thank you for just being yourself. Your work inspires me so much that my head spins with ideas. You make this day special by it being your very own. Continue to be happy and creative. Happy Birthday to You! Happy Birthday to You! Happy Birthday Dear Dyan! Happy Birthday to You! And Many, Many More. You are such an amazing inspiration to many of us out here in creative-craft-land. Love, Love, Love the colors of your sprays. Love, Love, Love your Journals! I have 3! Although I've never met you, you lift my spirits high whenever I see my colorful sprays and journals. Thank you so much for being YOU! Happy, happy birthday Dyan!! I'm a huge fan...have all of your sprays and most of your stamps and stencils!! I hope your day is fabulous!! Happy Birthday Lady Dy! Have a Great Day. Thanks for opening the door to whole new world for so many of us. Happy Birthday, Dyan. Keep on blessing the world with your art. Happy Birthday Dear Dyan !!!!!!! !Enjoy your special Day .you are a special Lady , thank you . Happiest Birthday to you Dyan who gives us such thrills, inky pinkies and joy. I love you Dyan. We are all blessed to have you. Thank you Jim for giving us the chance to give some lovin' back to Dyan on her special day! A Very Happy Birthday to Dyan! We love you & your wonderful wit! Happy Happy Birthday Dyan! Have a wonderful and bright day! Dyan Happy Happy Birthday! How does it feel to be 29? Hope you are feeling better and I hope you get chocolate cake for your Birthday! happy birthday to you, Lady Dy! I love your vivid colors! Happy Birthday Dyan. Hope you have a wonderfully DYLUSIONAL day! Happy Birthday, Dy! What a fun way to celebrate! I love Jim's "card" for you! Two incredibly talented people with a zest for life!!! I love the giveaway! I need some Dylusions in my stash!!! Happy Birthday to Dylan! Can't wait to see what you create Jim. I miss you and Cesar so Hi and hugs! Hey. Wishing you all the very best, Dyan. Love your spirit and whimsy. My best day last year was discovering you and buying so many of your fabulous products. You give me the opportunity to play everyday now!! Thank you!!! This is my birthday week too!! So from one fish to another have a prosperous and happy year!! Wishing you a Wonderful Day of Celebration. I learned how to get messy and do some altered art from you at the Crafty Scrapper last year and it was so much fun. I hope it's a fantastic Day doing all the things you love to do. Happy birthday Diane and keep those wonderful ideas coming! I love your craziness and flamboyancy. We should all be more like that! I'd sure love to win all those wonderful goodies you and Jim have going....what a hoot that would be. Eat lots of cake dearie! Happy Birthday Dyan! Your work brightens up even the saddest day. Who can help smiling at the bright vibrant colors and feeling happier for them. Thanks! Happy Birthday Dyan! Thanks for bringing such fabulous color into my life. To someone who puts the inspire in inspiration, Happy Birthday Dyan!!!! I hope you have a fabulous day and year. May your life be blessed with the happiness you give to others. Thank you for sharing your talents and spreading joy where ever you go! wow, happy birthday dyan. your really impressed jim. he made just the cutest balloon for you. i'll have a piece of cake for you. i'll send you the calories cause I don't need any more. hope it's a wonderful day and know that a bunch of us on this side of the pond are singing to you. Happy happy birthday, Queen Dyan! Thank you for the gifts you've given to all of us by sharing your vision and creativity. And remember - birthday calories don't count! Happy Birthday, Dy!! I love your fun creative spirit and your funky stamps. Have a wonderful day! Happy, happy birthday Dyan and Corrie !! because it is my birthday too !! Hope you will go on for many years creating your lovely art and developing more of those inky goodies ! Have a good one ! Happy Birthday Dyan. I cannot wait to see what is up creative sleeve this year. Happy Birthday Dyan! The world was blessed when you were born!! Have a great day!!! Happy Happy Happy Birthday Dyan! Hope you have lots of crafty fun today. Happy Birthday Dyan!! I hope you have an awesome day! Dyan wishing you a Bright and Beautiful Birthday!!! Happy Belated Birthday Dyan! Hope you are having a wonderful birthday week! Hope you have the happiest birthday EVER! Love all your products. You are such a creative inspiration! Thank you! Happy Birthday Dyan, Hope you had a wonderful day :) Thank you for a chance to win such a wonderful prize. Happy Birthday Dyan!!! Hope you have a WONDERFUL DAY! Happy Birthday Dyan! Hope you have an amazing birthday and all your wishes come true. Your products are awesome. Enjoy your day. Happy Day, Dyan. I'm sure you celebrate your birthday (or something) every day. I'd love to be at one of your parties. What a kick it would be. Happy Birthday Dyan!!! Hope your birthday is as fabulous as you are!!! Happy Happy Birthday Dyan.Have a great day and a wonderful, creative year! I hope you day is filled with fun and a lot of joy. You have taught so many of us some wonderful tricks on how to make something drab into something Wonderfully FUN and colorful. Not only that, you have put on the market some of the most amazing products and stamps! Bless You and Your wonderful Art! Hoping you have a day filled with all you wish for! Dyan - Wishing you what you are wishing for the most! You are a beautiful, creative force. I hope your birthday is full of love, laughter and birthday cake! A very happy birthday to a lovely crafty lady. I hope this year brings you inky fingers and lots of kitchen rolls.